I am a bit late to the Christmas sweetie post, but I thought I would share mine today anyway. I actually gave these to the 2 youngest boys teachers, to share with the TA's, and others teachers. Again, I will show you the 'budget way'. If you read any of my foodie, recipe posts, you will know I am a big fan of inexpensive and simple recipes. So lets crack on with my homemade chocolate sweets. Cover a baking sheet with either grease proof paper or cling film, in preparation. Melt the milk chocolate by preferred method, Don't forget if you're using the Microwave, turn the power down and check regularly. Spread the melted milk chocolate over the prepared tin. Don't worry too much about getting it to the edges, or being too neat, they are going to be cut up anyway. Place some whole Matchmakers on the top, in a line. Then put the tray in the fridge to set. Take the milk chocolate out of the fridge, don't worry if it's not set solid. Pour the white chocolate over the milk chocolate. Then break up some more Matchmakers and sprinkle on top, along with other Christmassy sprinkles, if you choose. Place in fridge to cool, but not set hard, or it will be too hard to cut. Once cooled, cut up and place back in fridge to set. 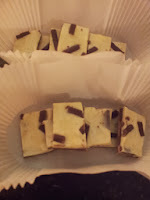 Just replace, from the above ingredients, white chocolate with dark, and mint Matchmakers with Orange. I also added approx 200ml of double cream. Follow the above method, until you get to melting the white chocolate. Instead of melting the dark chocolate, pour double cream into a saucepan to warm and add dark chocolate to that. Once chocolate is melted, set to one side to cool slightly, or it will melt the milk chocolate underneath. Spread Dark chocolate cream over the top and sprinkle with Matchmakers and Sprinkles. My children absolutely loved the White and milk chocolate, the teacher only ended up with 5 of them!! I do hope you give these a try! A tray full of the White chocolate ones cost me a total of £2.20 to make. That made approximately 16 large squares. The Dark ones only cost a little more because of the cream. Also, chefs treat, there is about half a box of Matchmakers left...........Result! Hope you have a delicious Christmas..